The Moon transits your 11th House of friendships and groups with which you affiliate this month, Gemini. You should enjoy April since your ruling planet turns direct on April 4th. This gives you the upper hand in all business affairs. April will have a much better feel to it than March did, Gemini. Good news: Venus (Love) enters your sign on April 3rd. Anytime Venus comes for a stay in your sign, you will be due for a treat. Not only will other people take note of you, and sense your charm, beauty and wit but will want to make commitments to you, personal and professional. With Venus in Gemini, the urge to splurge could overtake you, so be watchful. You will want to engage in more social activities and you feel much more outgoing than you did in March, Gemini. This is your month to shine with regards to your career, love life and friendships. On April 10th, Pluto (transformation) turns retrograde in your 8th House of power, resources you share with others, and insurance issues. These areas might encounter delays or frustrations as retrograde planets tend to slow events down or cause complications. With Pluto ruling the 8th House naturally, you could be feeling this effect which lasts until September 17th, 2012, so accept what comes your way and don't resist that which you have no control over, Gemini. Full Moon occurs in the sign of Libra on April 6th. This Moon impacts your 5th House of creativity, passion and what you do for pure enjoyment. 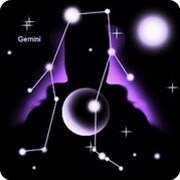 You might get a call or an email regarding a special relationship and the news you receive could delight you, Gemini. Remember with Venus in your sign, this is one of the MOST romantic months for you, so you should love what transpires romantically this month. FYI Gemini - Your creativity will soar to new heights and any idea or concept you come up with this month could hit the jackpot. So work on those artistic impulses, write down ideas as fast as they come at you and you may find yourself rewarded handsomely for an artistic project you have been working on. Also you will notice the loyalty of friends, near and far, and this should put you in a positive, upbeat mood. You enjoy the company of friends, family and the company you keep and notice you suddenly seem to be the life of the party. A new relationship could grow serious while an existing one could graduate to the next level. It really is your month to shine and shine you will, personally and professionally, Gemini. A New Moon in Taurus on April 21st joins Jupiter in your 12th House. Activities occurring behind closed doors and in private could bring in more income and you might be given the opportunity to showcase your skills behind the scenes. This could involve a professional goal or it might be a special relationship you wish to keep under wraps for the time being. Enjoy the opportunities that are headed your way this month. Your personal and professional life will keep you smiling and satisfied. The signs of another Gemini and a Sagittarius will play important roles in your month, Gemini. These individuals can assist you in more ways than you ever imagined on both personal and professional levels throughout the month of April. Get ready for some big changes as the first eclipse of the year occurs in the earliest degree of your sign in May.